My husband makes the best fettuccine alfredo. I never order this dish in a restaurant because it always comes with that gloopy creamy mess that's supposed to pass for alfredo sauce, but I actually beg him to make his version (which is adapted from The New York Times Cookbook). I think this also holds a place in my heart because this is the first dish my husband cooked for me for our first Valentines Day. Now you can all say it together....awwww! But really, this is a great version of the dish. The prosciutto adds a nice saltiness, and if you can get your hands on it, a good parmesan is worth the extra money. We've used plain ol' frozen peas from the grocery store in the past, but we had some frozen peas from a spring CSA share earlier in the season that really popped in your mouth. Next year, I'm buying extra and freezing them for the winter! This is not a lowfat recipe, but compared to other recipes that I've seen, it's the lower fat version! Cook the noodles in boiling salted water until al dente. You don't want to over cook the noodles as they will cook more and absorb the sauce later. Drain the noodles and place in a dry pan. Gently heat the noodles. Toss them gently while adding the butter and grinding the pepper over them. Add the garlic and cook for a couple of minutes. Add the half-and-half and allow to heat thoroughly, tossing once or twice, until most of the half-and-half has been absorbed. Add the cheese, peas and prosciutto. Heat, still tossing gently, for 2 to 3 minutes, until the noodles are evenly coated with the melted cheese. Serve immediately. I think I'm going to try this. The recipe looks simple enough, and I've had some good fettuccine alfredo out at restaurants, but never one that I thought was very genuine or delicious. Would it still work right without the prosciutto, or does that add a lot of the flavor? It would be fine without the prosciutto, I think, although I really like it in there. Just taste as you go, and add more salt as needed. You could always add different/more veggies and/or different meats, but this is the combo that we like. 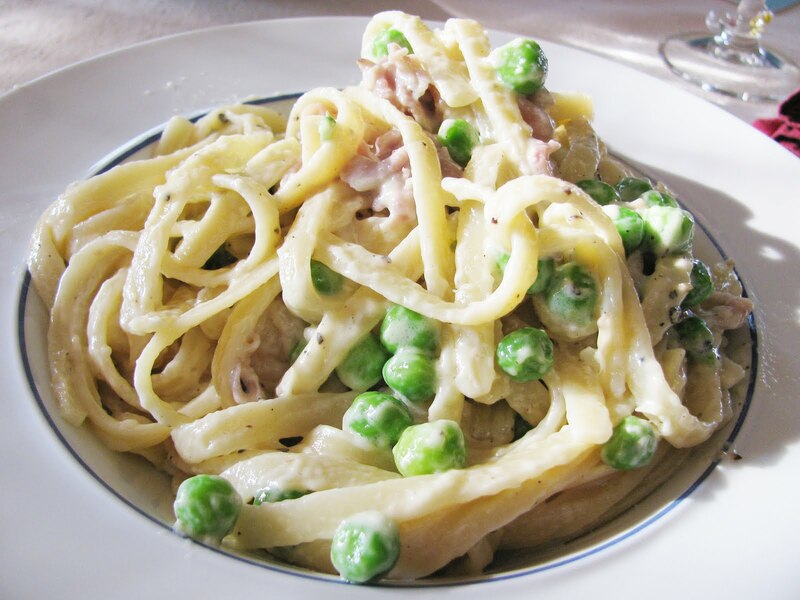 This is one of my favs, I love peas, and they along with the prosciutto make it marvelous to eat! Mmm looks delicious! Great comfort meal. Jaeger-LeCoultre will be today widely thought of as the most innovative gamers during the observe helping to make business. Having trialled a remarkable function while in the history in view helping to make, as clearly as best replica Patek Philippe watches manufacturing distinctive, luxury and sometimes special designer watches replica louis vuitton Damier Canvas bags Jaeger-LeCoultre stylish watches normally benefits awards since chosen considering the community along replica Rolex watches with professional panels the exact same. Recently, Jaeger LeCoultre surprised best replica Breitling watches UK all the watch-world as a result of creating that Hybris Mechanica that Grande Sonnerie. This is without a doubt formally much of our planet's a large number of innovative view fake Audemars Piguet watches with Twenty some issues. Along with not nearly as expensive the poor start of your dependents enterprise together high while in the Europe mountain tops. Antoine LeCoultre established their initially course on 1833 while in the little Swiss pile region of Le Sentier, perfectly located around the Vallee delaware Joux.